To conduct robust research and provide scientific information to inform and support the sound management and professional stewardship of Arizona’s fish and wildlife resources, and to ensure the credibility of the Department’s science. Address the Department’s programmatic management information needs. Provide research findings, scientific expertise, guidance, and training to inform management decisions and activities, sustain a skilled Department workforce, and maintain the Department’s role as a leader in wildlife management. Build and maintain research partnerships, outside funding, and a high level of expertise within the Branch to maximize Research Branch productivity and quality. The Research Branch has a staff of 18-20 full-time biologists who are assisted seasonally by interns and seasonal technicians. Our main office is located in Phoenix; however, projects are conducted throughout Arizona. The Research Branch conducts aquatic and terrestrial research, and provides biometrics support to the Department, based on management information needs identified within the Department. Research projects address a wide range of topics and are targeted to provide information to inform management decisions. This information often includes aspects of population dynamics, habitat relations, predator-prey interactions, population monitoring techniques, and the effect of management or development actions. 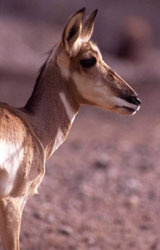 In addition to management-oriented research, the branch develops new and innovative techniques to assist in managing and monitoring wildlife populations, and provides training and scientific expertise to Department personnel. Funding comes from a variety of sources, including Federal funding through the Federal Aid in Wildlife Restoration Act and the Federal Aid in Sport Fish Restoration Act, as well as various contracts, grants, and cooperative agreements with other state, federal, or private organizations. O’Brien, C. S., P. R. Krausman, H. M. Boyd.2010.Influence of Coyotes on Habitat Use by Mule Deer Following a Wildfire. California Game and Fish. 96(1):7-22. Atwood, T. C., J. K. Young, J. P. Beckman, S. W. Breck, J. Fike, O. E. Rhodes, K. D. Bristow.2011.Modeling Connectivity of Black Bears in a Desert Sky Islands Archipelago. Biological Conservation.144:2851-2862. Avery, L. A., D. Ward, J. Marks.2011.Exercise Conditioning of Pond-Reared Razorback Suckers Decreases downstream Movement Upon Release into a Stream Environment. Western North American Naturalist.71:78-85. Justice-Allen, A. E., C. J. Luedtke, M. Overstreet, J. W. Caine III, T. R. Stephenson.2011.Prevalence of Mycoplasma ovipneumoniae in Desert Bighorn Sheep in Arizona. Desert Bighorn Council Transactions.51:1-12. Loberger, C. L., T. C. Theimer, S. S. Rosenstock, C. S. Wightman.2011.Use of restoration-treated ponderosa pine forest by tassel-eared squirrels. Journal of Mammalogy.92:1021-1027. Sesnie, S. E., B. G. Dickson, S. S. Rosenstock, J. Rundall.2011.A Comparison of Landsat TM and MODIS Vegetation Indices for Estimating Forage Phenology in Desert Bighorn Sheep (Ovis canadensis nelsoni) Habitat in the Sonoran Desert, USA. International Journal of Remote Sensing.DOI:10.1080/01431161.2011.592865. Besser, T. E., E. F. Cassirer, M. A. Highland, P. Wolff, A. Justice-Allen, K. Mansfield, M. A. Davis, W. Foreyt.2012.Bighorn Sheep Pneumonia: Sorting Out the Cause of a Polymicrobial Disease. Preventative Veterinary Medicine.109 (3-4):185.pdf. Schuler, K. L., D. E. Green, A. E. Justice-Allen, R. Jaffe, M. Cunningham, N. J. Thomas, M.G. Spalding, H. S. Ip.2012.Expansion of an Exotic Species and Concomitant Disease Outbreaks: Pigeon Paramyxovirus in Free-Ranging Eurasian Collared Doves.Ecohealth.9(2):163-170. Korman, J., S. J. D. Martell, C. J. Walters, A. S. Makinster, L. G. Coggins, M. D. Yard, W. R. Persons.2012. Estimating Recruitment Dynamics and Movements of Rainbow Trout (Oncorhynchus mykiss) in the Colorado River in Grand Canyon Using an Integrated Assessment Model. Canadian Journal of Fisheries Aquatic Science.69:1-23.pdf. Bunch, A. J., C. J. Walters, L. G. Coggins, Jr. 2013. Measurement Error in Fish Lengths: Evaluation and Management Implications. Fisheries.38 (7):320-326. Horncastle, V. J., R. F. Yarborough, B. G. Dickson, S. S. Rosenstock.2013.Summer Habitat Use by Adult Female Mule Deer in a Restoration-Treated Ponderosa Pine Forest. Wildlife Society Bulletin.DOI: 10.1002/wsb.301. Harding, L. E., J. Heffelfinger, D. Paetkau, E. Rubin, J. Dolphin, and A. Aoude. 2016. Reply to Hedrick: Genetics and recovery goals for Mexican wolves. Biological Conservation, http://dx.doi.org/10.1016/j.biocon.2016.12.034. Clement, M. J. 2016. Designing occupancy studies when false-positive detections occur. Methods in Ecology and Evolution 7(12):1538-1547. Clement, M. J., J. E. Hines, J. D. Nichols, K. L. Pardieck, and D. J. Ziolkowski Jr. 2016. Estimating indices of range shifts in birds using dynamic models when detection is imperfect. Global Change Biology 22(10):3273-3285. Stahr, K. J., and D. E. Shoup. 2016. The effects of macrophyte stem density and structural complexity on foraging return of invertivorous juvenile largemouth bass. North American Journal of Fisheries Management 36(4):788-792. Perez, C. R., S. A. Bonar, J. J. Amberg, B. Ladell, C. Rees, W. T. Stewart, C. J. Gill, C. Cantrell, A. T. Robinson. 2017. Comparison of American Fisheries Society (AFS) Standard Fish Sampling Techniques and Environmental DNA. North American Journal of Fisheries Management 35(5):1010-1027. Clement, M. J., S. J. Converse, J. A. Royle. 2017. Accounting for Imperfect Detection of Groups and Individuals When Estimating Abundance. Wiley Ecology and Evolution DOI10.1002/eca3.3284. Boyer, J. K., C. S. Guy, M. A. H. Webb, T. B. Horton, T. E. McMahon. 2017. Gear Comparison for Sampling Age-0 Mountain Whitefish in the Madison River, Montana. North American Journal of Fisheries Management 37:189-195. Boyer, J. K., C. S. Guy, M. A. H. Webb, T. B. Horton, T. E. McMahon. 2017. Reproductive Ecology, Spawning Behavior, and Juvenile Distribution of Mountain Whitefish in the Madison. Transactions of the American Fisheries Society 146:939-954. Mower, E. B., W. Strain, L. Rice, L. McCormick. 2017. Are Standard Protocols Needed for Performing Weight Counts? Journal of Applied Aquaculture DOI:10.1080/10454438.2017.1406421. Stahr, K. J., Rebecca L. Knudsen. 2018. Evaluating the Efficacy of Using Time-Lapse Cameras to Assess Angling Use: An Example from a High-Use Metropolitan Reservoir in Arizona. North American Journal of Fisheries Management DOI:10.1002/nafm.10026. Mann, R. D., C. G. Snow. 2018. Population-Specific Migration Patterns of Wild Adult Summer-Run Chinook Salmon Passing Wells Dam, Washington. North American Journal of Fisheries Management DOI.10.1002.nafm.10042. Reif, S., R. F. Yarborough, S. S. Rosenstock, E. L. Kalies, S. Hedwall.2013.Wildlife Habitat Values and Forest Structure in Southwestern Ponderosa Pine: Implications for Restoration. Working Paper. Ecological Restoration Institute. Bristow, K. D., L. E. Harding, S. R. Boe, M. L. Crabb, E. S. Rubin.2014.Pronghorn (Antilocapra americana) Movements and Habitat Use in the Big Chino Valley, Arizona. Technical Guidance Bulletin 15.Arizona Game and Fish Department. Stewart, B., A. Makinster, A. Vasey, L. Avenetti.2013.Salt River Reservoirs Golden Alga Project. Technical Guidance Bulletin.13.pdf. Justice-Allen, A., A. C. Knox.2014.The Prevalence of Pigeon Paramyxovirus 1 and Trichomonas gallinae in band-tailed pigeons (Patagioenas fasciata), mourning doves (Zenaida macroura) and white-winged doves (Zenaida asiatica).Final Report. U. S. Fish and Wildlife Service. Knox, A. C. 2014. Chronic Wasting Disease Report. Annual Report. Arizona Game and Fish Department.pdf. Rogowski, D. L., R. O. Osterhoudt, P. W. Wolters.2015. Status of the Lees Ferry Rainbow Trout Fishery-2014. Annual Report. U. S. Geological Survey, Grand Canyon Monitoring and Research Center, Flagstaff, AZ. Rogowski, D. L., P. W. Wolters.2015. Colorado River Fish Monitoring in Grand Canyon, Arizona-2014. Annual Report .U. S. Geological Survey, Grand Canyon Monitoring and Research Center, Flagstaff, AZ. Osterhoudt, R. O., D. L. Rogowski.2015. Little Colorado River Fish Monitoring in the Lower 1,200 Meters-2014. Annual Report. U. S. Geological Survey, Grand Canyon Monitoring and Research Center, Flagstaff, AZ. Rosenstock, S. S., B. Wolf.2010.What Photos and Neutrons Tell Us: How Wildlife Water Developments Benefit Nongame Wildlife in the Sonoran Desert. Arizona Wildlife Views .53(4):21-24.pdf. Warren, J., A. Jones.2011.The Fox and the (Four-Wheel) Hound. Arizona Wildlife Views.54 (2):27-30. Bunch, A., B. Stewart.2012.Tight Lines at Lee’s Ferry. Arizona Wildlife Views.55 (1):12-14. Stewart, B. 2012. A Changing Grand Canyon: Can High Flows Help? .Arizona Wildlife Views. 55(5):30-33.pdf. Bristow, K., M. Crabb.2013.Black Bears and the Wallow Fire. Arizona Wildlife Views.56 (1):8-13.pdf.